John Motson supported the Football for Headway tournament, which became the most successful fundraising day for Aldermore. Headway – the brain injury association – benefited from the work of Northampton’s Portman Asset Finance and Aldermore Bank as the Football for Headway tournament raised more than £13,000 for the charity. The event took place at St George’s Park, the FA’s national football centre, on Thursday, 4 October and was devised by Aldermore, who secured the services of legendary football commentator John Motson to host the tournament that comprised 21 teams represented by companies across the financial sector. Portman sent seven members of the team to the Staffordshire venue for Aldermore’s tournament, with the collective efforts of all the teams leading to a grand total of £13,450 being raised for Headway and its efforts to improve the lives of those who have suffered brain injuries. The annual five-a-side football tournament is held in memory of former Aldermore employee Adam Massen, who died from a brain injury in 2014. 14 finance broker teams took part in the charity tournament, which was won by Henry Howard, with Portman helping Headway enjoy a record-breaking year of funding, beating last year’s total of £12,000. 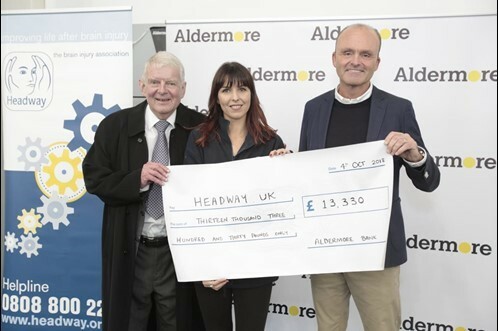 Almost £40,000 has been raised during the four years of fundraising, with Portman, Aldermore and the wider financial community committed to supporting Headway’s work. Jo Plant, Director of Fundraising at Headway, said: “Aldermore’s 5 a-side tournament is an event we always look forward to and we are again, extremely grateful to the bank’s staff and all the other participants who took time out of their schedule to take part. Head of Marketing at Portman Asset Finance Mark Kozo was honoured to have attended the tournament and was delighted with the involvement of Portman. He said: “Football for Headway has enjoyed a record-breaking year and Portman is proud to be involved in such a vital cause. “Headway’s goals reflect our own – it is vitally important that those less fortunate than us still enjoy a healthy and prosperous life. The former BBC commentator was host for the entire day, before presenting the cheque to the charity and posing for photographs with attendees.